Save for the people who like to scream “but what about The Office!”, the history of America trying to adapt popular British television shows in recent years has been abysmal at best. One of the shows trying to defy this recent trend was the wonderful and long-running Peep Show, which Starz announced it would be adapting into an across-the-pond sitcom in 2016, minus its lead U.K. stars David Mitchell and Robert Webb. 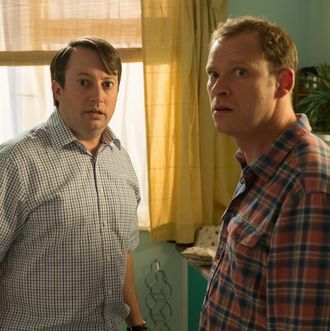 Peep Show’s creators, Sam Bain and Jesse Armstrong, were onboard as consulting producers to give the adaptation some clout, but despite those initial “we’re excited!” statements from the duo and Starz, there hasn’t been a peep about it since the initial announcement about 13 months ago. And do you wanna know why? Because this kind of adaption is tough, folks, and Bain and Armstrong learned it the hard way. In a new interview with Digital Spy, Bain explained that Starz ultimately “turned it down” after failing to get Peep Show into the right groove for audiences. Believe it or not, Peep Show has now tried to come overseas three times, with one of them even getting to the pilot stage with The Big Bang Theory’s Johnny Galecki. (Watch it here if you dare.) Maybe take the hint, you head honchos in the TV industry: Nobody wants to see this show adapted.